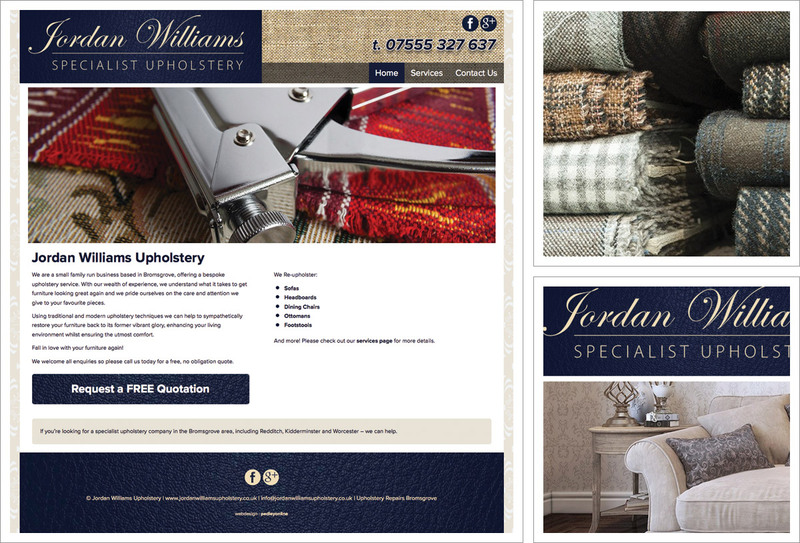 A small bespoke website for Bromsgrove based furniture upholstery specialists Jordan Williams Upholstery. New to the web, Jordan Williams wanted to start with something small and look to develop it further in the future with new content and pages. A responsive, mobile friendly design means this website adapts and displays according to the device being used to view it. Great for mobiles, tablets, desktop PCs and laptops. There’s plenty of room for site expansion with the addition of a portfolio for completed projects, frequently asked questions and more detailed services pages and we will work with Jordan Williams to help them get the very best from their website as time and budget allows. We also helped with set up and styling of Facebook and Google+ pages which will be perfect for showing progress and completed projects to inspire people to let Jordan Williams show them how to fall in love with their furniture again.